Sorry if someone already asked, but I'll make it quick: Anyone know the INSIDE dimensions of the MAX 130D? Thank you very much! The display's dimensions is what I was referring to... sorry for confusion. If anyone could tell me the display's dimensions that would be greatly appreciated as I am trying to plan out my aquascape. Nope, that's exactly what I needed... thank you very much! I was worried that I'd only have 12" of display depth... the 16" will definately be nice. Now let's just hope I can afford the thing with our economy. oh no, it is pretty deep. you can fit quite a bit of rock in the tank. 1. How much does the average MAX evaporate per day? How long can it go before you have to top-off? 2. Why has there never been, to my knowledge anyway, a MAX as Featured Tank of the Month? go right ahead. This would be a great place for RSM info in general but just kind of became a member list. My tank thread become the dump on RSM question place. 2. Chris Marks is scared of the RSM community. There may be one day right now the tanks that win are way beyond any RSM tank here IMO, the RSM are still growing and maturing. It is hard to win a TOTM with a young setup unless you fake it by purchasing every coral in site with no regard for growth and well being. TOTM also died out for a bit but is back in action. Biggest factor is RSM are still new on the scene and tanks are growing out yet. Sweet, will post here. Also, thanks for the fast & informitive replys... makes me just that much more excited about joining the MAX community. At least I'm not too late to join in the fun! I had 1 more question (sorry): This is going to be a Caribbean biotope tank & will incorporate a fair amount of sea grass or Caulpera in display. I was worried that due do all the plant life the tank's oxgen level might fall dangerously low at night... would I need to worry about this or will the skimmer provide plenty of aeration? If not, how would I raise oxygen level at night? Air bubbler? A skimmer does add a lot back into the tank. This is a question I can not fully answer. I would post it HERE or see if someone has asked it already. They can give you much more info on the subject. Not too many RSM's like that I am excited to see what you come up with! 1. I keep hearing about cracks in glass on the side curves of the tank. Do these occur often? 2. I currently don't have access to the tools needed to fabricate SteveT's media rack, what is the optimal configuration for the stock filter media area of the tank? Also, is the stock skimmer sufficient for most apps? 3. Would a single K1 or K2 pump be an okay addition to increase flow for a tank this size? FYI: I'm planning on mostly softies and maybe some LPS/SPS with lower light and flow requirements. I'm also going to try for a completely tank-raised or aquacultured live stock list. Thanks! I'm looking forward to joining the RSM ranks here! 1. No they are not common. You saw two recently but it is rare. Like anything in this world it can break but I wouldn't let it worry you. 2. The stock skimmer is pretty much garbage. Almost every replaces it with a better unit like the tunze 9002. If you want to run a media rack you can find them at www.mediabaskets.com You can give your skimmer a chance but for the little it produces you are better off just ripping it out and creating a fuge with that space or getting a unit that works. thanks Steve T! Went out a picked 'er up on Sunday. I'll start a new thread. I have to say up front that I am new to reefing, but we love it!!! My husband and I started our first nano-reef about six months ago. We started with a 14 gallon bio-cube. It is beautiful, but we are ready for something larger already! Our new RSM 250 will arrive on Aug 27 and we are counting down the days. This is better than Christmas! Tonight, we are picking out the live rock so that we will be as ready as possible when the new tank arrives. I am so glad that I have discovered this forum. I think I have read every word. There isn't too much out there about the 250. We love the look of the tank and I hope we have made the right decision. Any words of wisdom from anyone? I enjoy all of you so much and just want you to know that you have an avid audience. StevieT, if you are out there, I love your YouTube post. Your tank is so pretty! One of our first additions will be a mandarin. I will post some pics once we get it set up. Good to see another 250 owner out there. 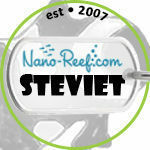 There are actually more 250 owners on Reef Sancturary than Nano-reef.com since it is a larger tank, you may want to check them out. Also, I would advise on not having a mandarin as your first fish, actually strongly not advise that at all. They need an established aquarium with lots of natural pods. I have mine trained to eat frozen but in a new tank you neither have the water chemistry to handle the over feeding that training takes or to handle the pop population the fish needs to survive. Look at one well down the road as you mature in this hobby. If you get a tank thread up post a link, I can add you to this list, good luck! I just changed the carbon filter for the first time. Is it normal for the water to be real cloudy after putting in a new carbon filter? Hey guys! Sorry, one more question I forgot to ask earlier, what is the height of the water column (ie: from bottom glass to water's surface) for the MAX? I know I read it's about 24" tall, but I realize some of that's the light hood. It is 24", that does not include the hood. I will confirm tomorrow when I get to the office. Anyone use the reef base subtrate that came with the starter kit? Anyone have a chiller on their RSM? If so which is a good one to buy? I purchased and installed a AquaEuroUSA Mighty Pro 1/10 HP, it is a little overkill but it was on sale and I could'nt pass up the price. It is extremely quiet and keeps my tank at 79 degrees give or take a full degree. Wow running a chiller is soooo much cheaper then running the house AC to keep the tank temp down. it was 13 months ago when i decided to eventually get a RSM and bought the rack and cup from steve T.
what is the most favourable substrate for me to buy... i know not to get the red sea one as everyone's conseus is that theirs is crap. also what is more effective ... a koralie or a vortech M10 or M20?